Then Jesus called the twelve together and gave them power and authority over all demons and to cure diseases, and he sent them out to proclaim the kingdom of God and to heal. He said to them, “Take nothing for your journey, no staff, nor bag, nor bread, nor money—not even an extra tunic. Whatever house you enter, stay there, and leave from there. Wherever they do not welcome you, as you are leaving that town shake the dust off your feet as a testimony against them.” They departed and went through the villages, bringing the good news and curing diseases everywhere. This must have been a dramatic moment for Jesus and his disciples. In the previous chapter of Luke, Jesus’s disciples are portrayed as not understanding his teachings (Luke 8:9–10) and of not having faith (Luke 8:22–25). Jesus is clearly frustrated with their immaturity. Now with little evidence that anything has changed, Jesus is sending them out on their own. Why would Jesus do this? He needed to break the bonds of dependency. As long as they stayed together as a codependent clump, they had little chance of maturing. By forcing them to disband, Jesus also forces them to grow. The lower trigram of this hexagram is Chaos, whose image is Water. Water often represents a destructive force in the Bible, as when God tells Noah, “I am going to bring a flood of waters on the earth, to destroy from under heaven all flesh in which is the breath of life; everything that is on the earth shall die” (Gen. 6:17–18). But the danger inherent in the lower trigram is dissipated by the upper trigram, Spirit, whose image is Gentle Wind. Again we hear an echo from Genesis. It is the wind that finally dissipates the destructive flood God has unleashed: “And God made a wind blow over the earth, and the waters subsided; the fountains of the deep and the windows of the heavens were closed, the rain from the heavens was restrained, and the waters gradually receded from the earth” (Gen. 8:1–3). To gently disperse the internal energy that has been stored up and is creating a blockage. To allow dispersal to occur so that unification becomes possible. To let go of the Ego that has proven so divisive. To use religious rituals and devotion to overcome Ego and unite the people. To use common goals to overcome individual Ego. To realize that through hardness and selfishness the heart grows rigid. To understand that rigidity in the heart leads to separation. To see in the divine presence the unity of all. A moving line in the bottom position warns that the time for dispersal is at the beginning, before that which needs to be dispersed has had time to solidify. Misunderstandings and mistrust must be dispersed quickly and decisively. A moving line in the second position recommends a dispersal of a blockage within an individual. The blockage could be anger, distrust, or disgust. Whatever it is, it is causing alienation. This is a time to seek moderation, Wisdom, and the support of others. A moving line in the third position describes a time when work has become so difficult that rational thought is no longer possible. This is the time to set aside personal desires and the barriers that have been created against others. This dispersal is necessary to achieve a goal that requires great self-sacrifice and strength. A moving line in the fourth position recommends a dispersal of short-sighted interests and private alliances. The task that must be accomplished is one that affects everybody. To accomplish such a task, one must have great Wisdom and the ability to see beyond self-interest. Short-term interests must be sacrificed for long-term goals. Not many can achieve this. One must truly be able to see the unity of all life. A moving line in the fifth position describes the recovery that follows dispersal. The line suggests that a great idea championed by a person in power is the rallying point for recovery. This same person is the one who can disperse misunderstandings that block unification. A moving line in the top position describes the need to disperse a dangerous situation. The danger is not directed at an individual, but at a group. The dispersal may be in the form of getting away before danger comes, keeping danger at a distance, or escaping from a danger that is already present. Return to the Hexagram Index Table [click here]. Return to Consulting the Christian I Ching [click here]. Purchase a printed copy of Wisdom's Way; The Christian I Ching [click here]. 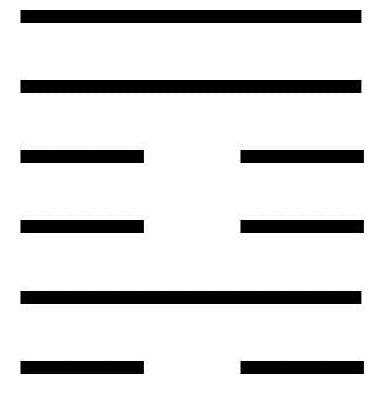 Learn about our Online Christian I Ching Workshop [click here]. Find out about personal consultations [click here]. Reproduced with permission from Wisdom's Way; The Christian I Ching copyright (c) 2015 Roger Sessions.